Harry Potter Moment of the Week (7) What magical creature would you like living in your house? 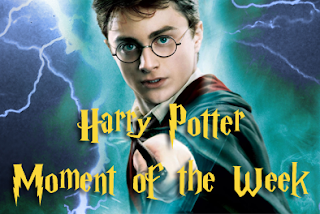 It’s time for Harry Potter Moment of the Week, hosted by Leah of Uncorked Thoughts and Micheline of Lunar Rainbows Reviews. The idea is to get Harry Potter fans together and discuss our favourite things about the series; be it a favourite moment, character, magical item, spell, quote or object from the books, films or J.K Rowling herself. You can find the list of future topics here. If you’d like to take part, visit today’s post and sign up with the linky. Today’s topic: What magical creature would you like living in your house? Honestly, my first thought was a house elf. Who wouldn’t want a little creature to cook, clean and do chores for you? However, I share Hermione’s views on the whole slavery of a species thing, so I don’t think my conscience would let me get away with it. 3) They could serenade you with sweet songs. 5) Their tears also have healing powers, which would be a big bonus! No more need for a first-aid kit in the house when you have your own magical healing phoenix. 6) Their feathers would make awesome quills. 7) They can also disappear and reappear, taking whoever is holding them along-like Apparition. That would be really handy when you are running late or wanting to save on travel fares. But the best part is, instead of having to say a tragic farewell to your pet at the end of its life, the phoenix would grow old, die and be reborn over and over. So you could enjoy your pet forever, getting to see him as a little chick again every so often and then eventually passing him on to your children or grandchildren. How awesome is that? Which magical creature would you choose?